Abdominal pain and hip pain are common problems and in many instances it is transient and not serious. However, it can be quite distressing especially when it occurs in areas that we associated with vital organs or where serious conditions can arise. The area above the right hip is one such area as pain here often makes us think of appendicitis. 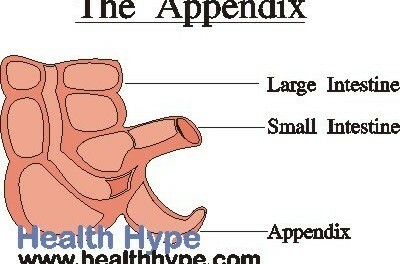 If left unattended the appendix can burst with serious and even life-threatening complications. However, pain in this region is not only due to appendicitis. There are many organs that lie above the right hip and a range of conditions can be responsible for the pain. The hip is the joint where the acetabulum of the pelvic bone and the head of the femur meet. Most people refer to the pelvic bones as the hip, and more specifically the uppermost portion of it which is known as the ilium. The part that is easily felt is the iliac crest. When people refer to the area above the hip, they are usually talking about the area above the iliac crest. 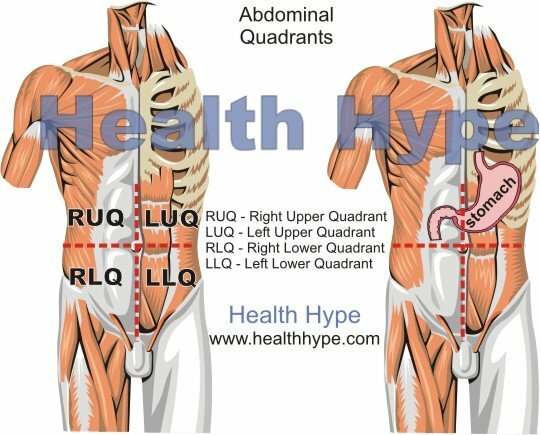 This correlates with the upper part of the right lower quadrant (RLQ). Although some of these structures may be slightly below the iliac crest and still be within the right lower quadrant, it can cause cause pain higher than where it is actually located. Therefore pain above the right hip should be considered under right lower abdominal pain and right flank pain. There are a number of different causes of pain above the right hip. The problem may be with the gastrointestinal tract, urinary tract or female reproductive system. The character and severity of pain can vary depending on the site that is located and the underlying disease that causes it. Age may also play a role in that some conditions are more likely to occur in children while other conditions are common causes of pain above the right hip in adults and the elderly. The conditions listed below are not the only possible causes of pain. It is among the more common causes but a proper diagnosis should be made by a medical professional. The abdominal wall is made up of skin, fat, muscles, fascia and peritoneum. Injury to the abdominal wall, muscle strain, hernia and irritation or infection of the peritoneum (peritonitis) are some of the abdominal wall causes of pain above the right hip. The symptoms for these conditions can vary but severe abdominal tenderness is present with the pain. Abdominal wall problems are relatively common although most people tend to first think about the inner organs being the source of the pain. 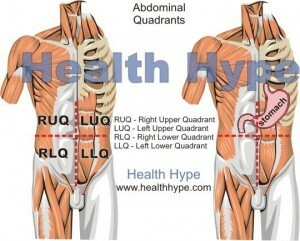 Also refer to abdominal muscle pain. Appendicitis is a condition where the vermiform appendix becomes inflamed. The vermiform appendix is a small tube-like pouch that protrudes from the cecum of the large intestine. It can become inflamed and infected with a risk of rupturing if not treated promptly. An appendix abscess can also form within it. Diverticulitis is a condition where pouches that form in the wall of the gut become inflamed. These bulging pouches (diverticula) more often tend to form in the large intestine. It can exist for years and decades without causing symptoms. However, when these pouches become inflamed or infected then the symptoms below may be seen. Gastroenteritis is the inflammation of the stomach and intestines which is most commonly due to an infection or toxins produced by certain microorganisms. Viral gastroenteritis is one of the most common types and is generally referred to as the stomach flu. Peptic ulcers are found in the upper part of the gut, specifically in the stomach or first part of the small intestine (duodenum) and sometimes the esophagus. If these ulcers tear, the intestinal contents can leak into the abdominal cavity and cause peritonitis. Colorectal cancer is a malignant tumor or tumors in the colon. The growth can start in the colon (primary cancer) or spread to the colon from elsewhere in the body (secondary or metastatic cancer). It is among the top 10 most common cancers and can be quite aggressive. This video on pain above the hips was produced by the Health Hype team. Blockage of the bowels can occur for a number of reasons as discussed under small intestine obstruction and large intestine obstruction. The severity of symptoms depends on whether it is a complete or partial obstruction and whether the obstruction lies in the small or large intestine. A kidney stone is a hard mass that forms within the kidney as result of certain constituents of urine crystallizing. It is also known as a renal calculus. Most stones are passed out in the urine but it can sometimes become trapped within the kidney, ureter or bladder. A urinary tract infection (UTI) is common especially among females. It can involve any part of the urinary tract. Bacteria are the most common cause of UTIs. Most infections are ascending and often stop at the bladder but can spread upwards to the ureters and even the kidneys. Reviewed and updated on 10 August 2018.